The Society for Promotion of Nature Tourism and Sports (SPORTS) is a society formed by the Lakshadweep Administration in 1982 with the avowed aim of tapping tourism potential of the islands and to act as the nodal agency of Lakshadweep Administration for promotion of tourism in the islands. It is registered under Section 3 of the Societies Registration Act of 1860. Hon’ble Administrator, Lakshadweep is the Chairman of the Society and Shri. H. Rajesh Prasad IAS is the Chairman at present. Under him Managing Director discharges the functions of Chief Executive Officer. 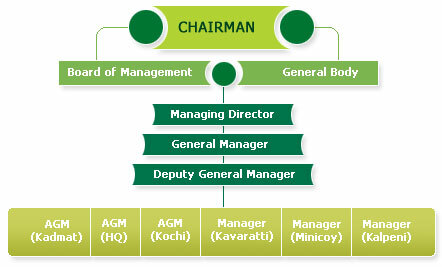 The organizational structure of the Society is given below. The primary aim of the organization is to promote eco-friendly tourism and recreational activities in the islands in association with and under guidance of the Lakshadweep Administration. SPORTS also acts as hospitality and catering wing of the Lakshadweep Administration. The Society operates tourist resorts at Kadmat, Minicoy and Kavaratti. It also conducts package tour covering three islands - Minicoy, Kalpeni and Kavaratti. Apart from operating these resorts SPORTS is manning State Guest House and Dak Bungalows of the Administration. SPORTS also strives to provide employment opportunities to the educated locals the tourism sector.